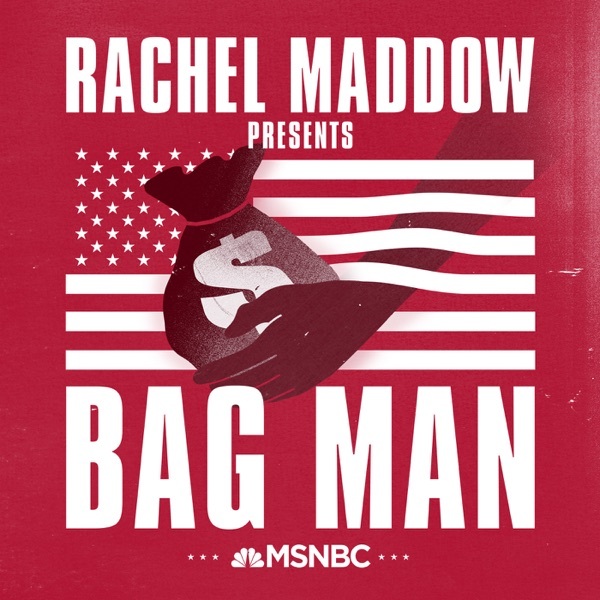 Check out a sneak preview of Bag Man, Rachel Maddow’s first original podcast. First 2 episodes drop October 30th. Subscribe now. Love this history lesson. Rachel does such a great job of reporting exactly what is going. Brilliant! Best podcast in years. Sharp, clean storytelling. Relevant and insightful. Highly reccomend. I have been watching @maddow for 10 years and she is the real deal, real news, real stories and real people. She delivers news stories like nobody else and should be mainstream so people know what really is going on in American politics. Rick Wagner I appreciate your perspective. But it largly demonstrates the point I was making in my last comment. sorry for the following rant: it's not just that politics is being treated as team sport on a mainstream level... (I know liberals who voted for Trump after the nomination was taken from Bernie and conservatives who want Donald impeached - at least some anecdotal evidence that your brother-in-law shouldn't be treated as a representative for an entire group. he represents himself. that's it.) many also treat politics as their new religion..."the progressive agenda is the only solution" is an unsubstantiated, faith based claim and politics should never be based on faith. just because one perceives a certain group as political rivals doesn't mean that perceived out group is fair game to slander or heap with misplaced, over moralized bigotry / stereotype based assumptions. education isn't kryptonite to conservatives. at least not in my neck of the woods where most self identified conservatives are highly educated and not fond of trump. I'm thankful to read that you try to avoid the pit falls of stereotyping.. but... considering what you go on to say just a few sentences later, I sincerely hope you keep trying. public service announcement: Check out the Heineken beer commercial called "worlds apart". it's on YouTube. it offers several real life examples (proof that) no one need agree to get along. no one need agree about politics or whatever else... to build something together. no one need agree for us to progress together. whatever your using (religion, class, ... politics, tribalism, the bad examples of few applied to all) to justify treating thoes u don't agree with poorly/whatever you're using to tell yourself you're better than thoes you disagree with/whatever you're using to justify not doing the hard work of extending the benefit of the doubt to your political opponents.. is anti-progressive. Ezra Fickov It's true politics has almost become a game where we cheer and protect our team and love to see the other team lose. I really try to rise above that since I've seen what blind locality can do regarding Trump voters. my brother in law believes Trump's misspellings are on purpose and coded messages to secret operatives. He's fairly normal aside from this madness. the big difference between the 2 sides is the right will defend their liars till the end. am Franklin gets booted (hard choice) they elect their rapists. we believe our scientists, blue states create most of the gdp, we like education, medicine, engineering, universities, laws arts, media, tech. it's very hard to find conservative professuonals. I do live in Portland OR but education is kryptonite to conservatives. maddow just seems genuine, passionate and intelligent. the right lives their news hosts if they can come up with new dem insult phrases. we like our news people if they remind us of ourselves. maddow seems like a person I'd enjoy knowing. that's her biggest gift as a media personality. JC oh oh oh oops sorry! was supposed to say TV SCH t i c k to him... Lucky's on The Apprentice still! it is so frightening the way he's destroying this country and dividing it and I can't believe all this bomb stuff honestly I always thought somebody would go after him first but he's really stirred the pot now. and he really loves those rallies so he can stir up his base how terrifying, I think for Katy tur will be scarred for life. I'd like to pick up her book about those rallies but I probably get even more upset okay enough Rachel turn me into politics of Junkie! I just discovered the other night I've been watching her only as long as she's been on TV, so that was a pleasant surprise I didn't miss anything, but I do get mad when I miss her! and no not to Brian Williams but how many times a night do they show him and his show they need to mix it up a little like one more Rachel! apologies for punctuation! okay got to go try to get a life ... well maybe in the morning! I know it's going to be good. How can you go wrong with Rachel Maddow? Robert Kutulis You mean the one that has been substantiated a dozen times over, where at least 6 people named in the dossier have been indicted? That one? yaaaaaaay im listening to it! i can't wait!